Please note, our summer hours have changed this year. Starting May 1, we are only open during the week (Monday-Friday) from 8:00am until 5:00pm. We will be closed Saturdays and Sundays! 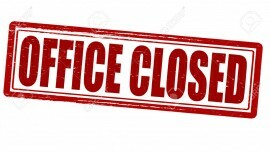 Our office will be closed for the mornings of Wednesday February 1st and 8th. We will be open from 12:00pm-4:00pm. Our regular winter hours apply to the rest of the week. Thank-you!